Here are some photos from our Easter celebration this past weekend. 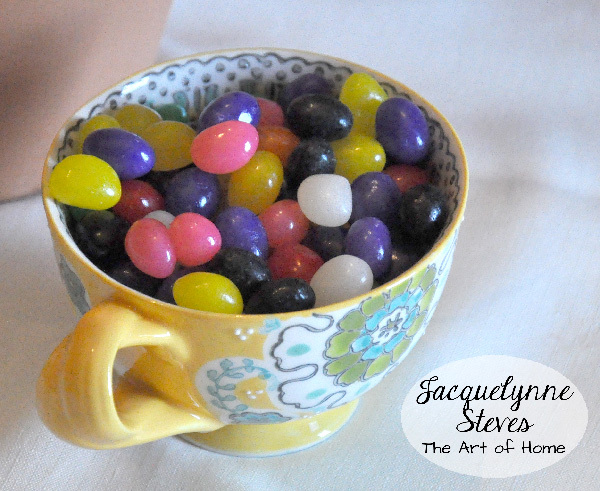 I have some really easy Easter decorating ideas- Easter decorating is so much fun! The colors are bright and cheerful, and I love the nod to nature and Spring that you can add to your table. This Easter Egg Lawn Centerpiece is something I have been wanting to try for years- but I never remembered to plant the grass seed in time! This year I’m so glad that I did remember! It will take about 3-4 weeks to get a nice little “lawn” going, so go get your calendar right now (I’ll wait…..). Find the date when you will need your centerpiece, then count back 4 weeks and mark your calendar to plant your grass seed. This is a really simple project that your kids or grandkids will love helping with. The hardest part is remembering to start it a few weeks ahead of your event! Here’s how you do it- find a shallow planter. I actually used a very large pasta/salad serving bowl from my kitchen. Put a few pebbles at the bottom for drainage, then fill with potting soil. Sprinkle with grass seed, use a fork to gently work the seed into the top of the soil. Water and place in a warm sunny place. (It has to be warm- I tried putting it out on my covered porch, but it was too cold and the seeds did nothing. I moved it into the house and within a week they started sprouting up.) Keep moist. 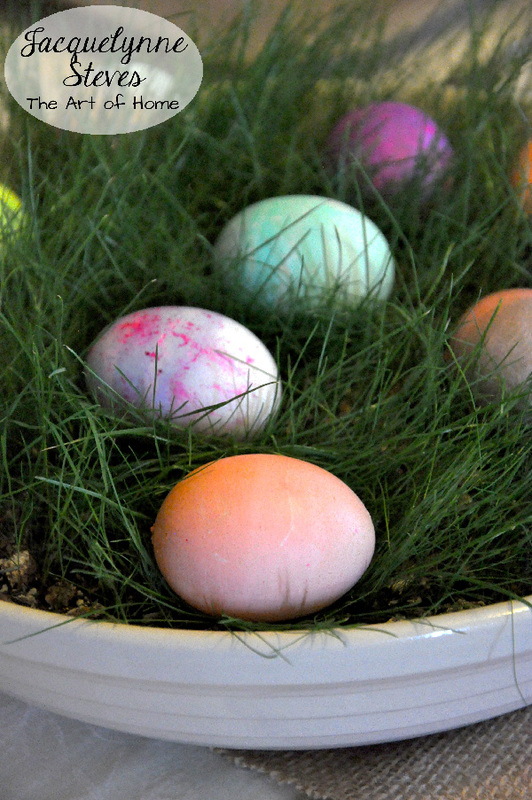 When your “lawn” is ready, place real or plastic Easter eggs in the grass to display. We had Easter dinner at our house this year- for the first time in almost 20 years! Usually, my mom has it at her house but she wasn’t up to it this year. Since my kids are grown up, it’s been quite a while since the “Easter Bunny” has visited our house. 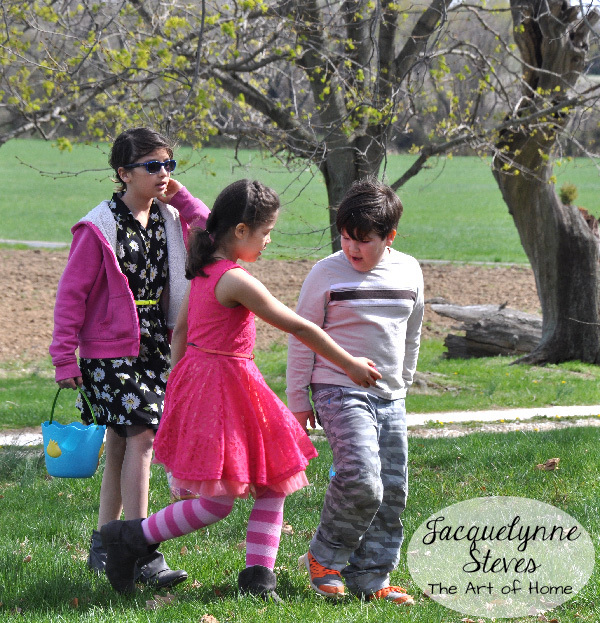 It was really fun to have the nieces and nephews here for an egg hunt in our yard. 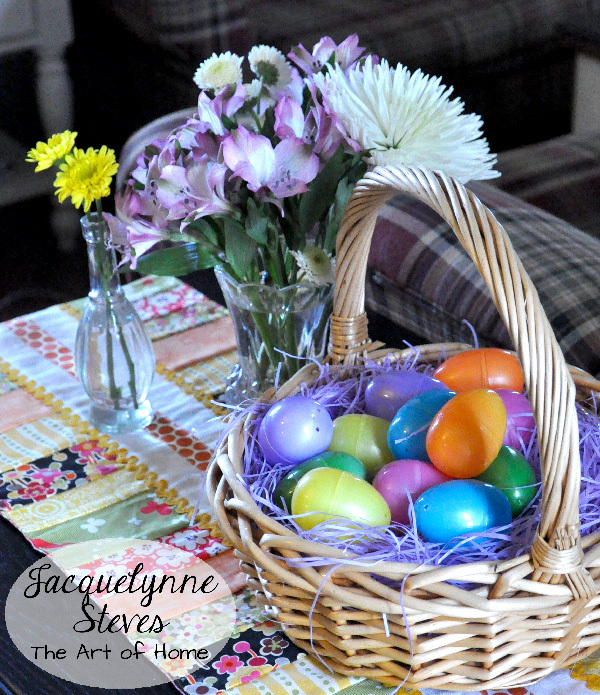 For our Easter table, I used cream colored table cloths and a burlap runner. Here’s a hint- if you have to use more than one table cloth to cover your table(s), and they don’t quite match, a long runner is a good way to bring them together and draw attention away from the mis-match. I got some small potted miniature daffodils and tulips from the nursery. Rather than have them wrap the pots with the shiny foil that they offer, I asked them to wrap them with the foil shiny-side-in (wrong side out). The white foil lining looks almost like a rustic white paper wrapper. Then I lined the pots up along the burlap runner. These doubled as gifts- all of the ladies at the table got to take home a potted flower when they went home. 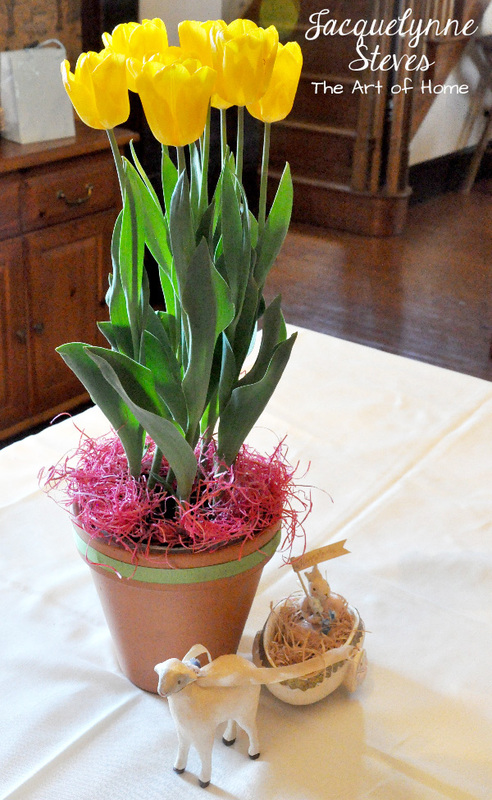 On the buffet table, I placed a large potted tulip inside a clay pot. I used a glue gun to attach a bit of grosgrain ribbon to the rim. I used some pink wood shreds (found at the craft store- I have them in my craft supply stash in lots of different colors- you never know when they’ll come in handy!) along the top to cover the soil and edge of the plastic pot. So there’s the “replay” on our Easter dinner. What’s your favorite idea listed above? 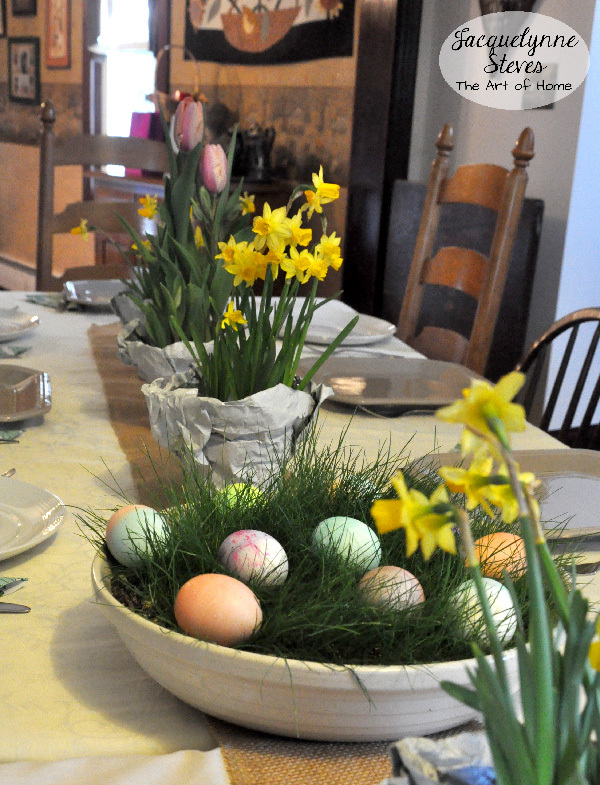 What’s your favorite simple Spring or Easter decorating tip? Share it with us in the comments! This article was posted in Crafts & DIY, Decorating, Easter, Spring. Bookmark the permalink. Follow comments with the RSS feed for this post.Post a Comment or leave a trackback: Trackback URL. 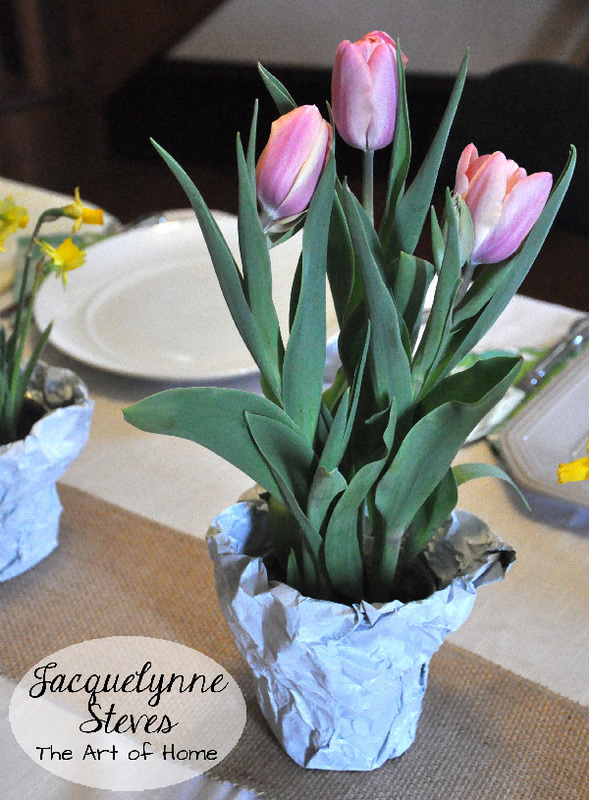 What great ideas for Easter decorations. I love the idea for growing grass to set the Easter eggs in. My favorite though is using the potted plants on the table and then giving one to each of the ladies to take home. How pretty! 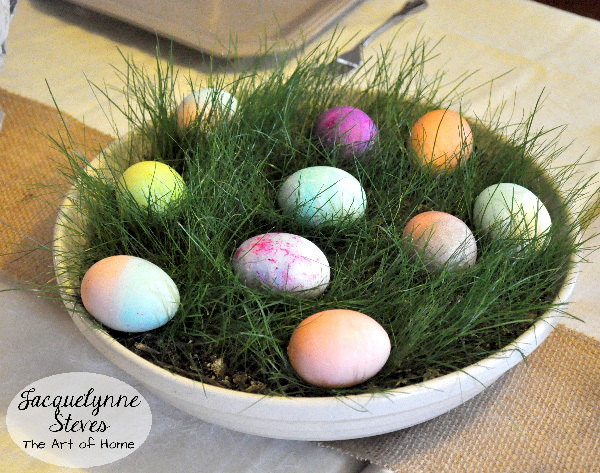 I just love the fresh grass centerpiece with the eggs – such a great idea! I love the newness of freshly growing grass this time of year, and it is such a great idea to bring it inside! I still have the little “lawn” going- but now that Easter is over, I’m trying to think of another way to display it for the summer…. If you don’t get your grass planted intime you can purchase a little sod as a last minute alternative. Also, you could purchase miniature adrondick chairs, a small umbrella and some super balls to place around for a nice summer scene. If you wanted to get really adventurous you could make your own vollyball court with wooden dowels and some lace netting. Don’t forget to keep the “Lawn” trimmed using scissors. I guess you can tell I loved the grass bowl idea. Kevyn- you’ve given us lots of other wonderfully creative ideas to consider! Thanks!